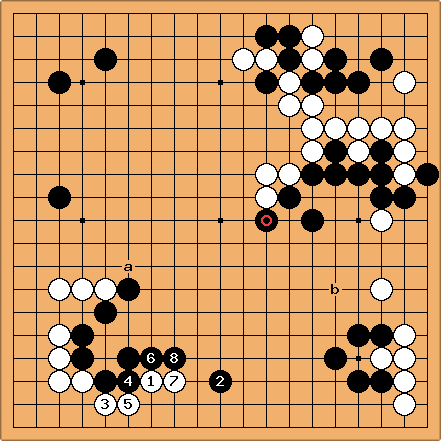 My feeling is that this position should be better for black as he should be able to compensate the white corners with his territory at the top and additionally has a lot of potential on the lower side. Is this the proper way to look at this position? My question here is: Is this invasion reasonable? How should black proceed? 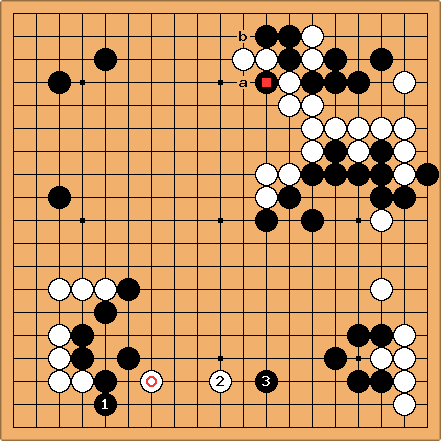 Is there a better way for black (or for white)? Is the immediate counter-invasion at 4 correct or should black play differently? The peep at 6 was supposed to make white heavy - but I now think that if black wants to peep he should do so at a - or what do you think? Dieter: I would invade at , slightly more towards Black's weaker group. If Black approaches from his stronger side, Black's group comes under pressure. ... if , then reduces the lower side considerably, given that the monkey jump at a is also still available. Andy Pierce: I'm with Dieter on this one. is too close to black's strength. After something like , , , white doesn't have a base, has hurt white's corner, and has strengthened black on the right. Actually, in this position, I think the top is bigger than the bottom so I'd consider tenuki instead of responding to , and pull out the stone on the top with a.
Dieter: Andy, I differ on what to do with the tenuki, mostly because White b is sente. Further comments below Kirby's. Kirby: Neither of these responses address the issue of what black should do given that white invaded as he did. I agree with Dieter about his choice of invasion for white particularly since the right group is weaker. However, I think that white's invasion as he played in the game is not terrible. I think that you can't expect to kill white, but you should use the opportunity to attack and to make profit for yourself. That being said, I don't think that black did poorly with his choice of peep, since it aids the right side, which could potentially end up weak anyway. I think what is "best" depends on the intentions that you have. It seems to me that it is hard to get many points on the bottom for black anyway, since he is "floating" on the third line, anyway with the right group. I might not play what's in the diagram shown below, but it is something I'd consider. White is still not totally out of danger, and you can shift your focus of where you want to make points. Maybe 4 in my diagram is too soft on black. It is kind of hard for me to decide. But I think it's your plan that matters more than the exact move. I think I like how black played in game best. ... using sente to defend and build on the left side. Still this is not satisfactory. So I will pause with accepting White has a better position in this game, and think about where the real weakness of White may lie. Kirby: In my opinion, this last result that Dieter has shown is not that bad for black. White will get something out of the invasion, and you couldn't have expected for black to have all of the area anyway. I had regrets about the bottom right group of black's being too high, but on the other hand, white is also high on the bottom. I think this is a reasonable result.